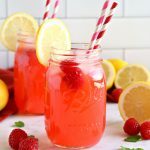 This Easy Healthy Raspberry Lemonade is the perfect summer refreshment without all those empty calories. Made with fresh fruit and NO refined sugar! Add the juice of 5 lemons, honey and raspberries, along with 1 cup of the water to a blender and blend on high speed until smooth. Strain the mixture into a pitcher to remove the foam and raspberry seeds, and add the remaining 3-4 cups of water (to taste) to the raspberry mixture. Add ice, fresh raspberries, lemon slices and mint leaves (if desired) for garnish. Serve in mason jars or tall glasses with paper straws and a slice of lemon.